The West Coast ride starts in the river city of Hobart, Tasmania's largest city and capital. Take your time to enjoy the city before the tour begins. It has a plethora of things to do and see. Arrive the weekend before the ride begins and take in Salamanca markets, walk the botanic gardens, ride the rail trail, visit Huon Valley and Bruny Island, take the ferry ride up to the MONA gallery with its remarkable collection of new and ancient art, mountain bike down Mt Wellington, enjoy the bars and restaurants. The West Coast ride is a whole lot different to the East Coast. Think forest and think rivers and think hills - most of all think wilderness. First day out starts with a gentle ride along rail trail and then alongside the River Derwent to the town of Bridgewater. We keep tracking all along the Derwent River through the settlement of New Norfolk, the third oldest settlement in Tasmania, settled when the convict settlement on Norfolk Island was closed. Then we are heading west again for a first National Park camp at Mt Field (second for combined tour). Mt Field is all about towering forests and waterfalls and abundant fauna and flora, including the reclusive platypus. From the National Park camp, we head to the end of the road at Strathgordon deep in the world heritage wilderness area and and on the edge of the controversial Lake Pedder. This is Franklin-Gordon Wild Rivers country and another National Park camp. The "end of the road ride" requires a turnaround and return to Mt Field, for some more National Park camping and a chance to walk the tracks you missed first time around. We continue to follow the River Derwent onto the highlands and the hydroelectric town of Tarraleah. The old houses used during the building of the hydro facilities have all been converted to charming cottage accommodation. This is a classic highlands experience. From here we make our way to Derwent Bridge and Lake St Clair. The lake is Australia's deepest freshwater lake and provides a perfect backdrop for the first explore day for this leg. It will be a much needed rest day after 5 days of hilly riding. The next part of the ride takes us onto the West Coast proper. This is an area of rugged mountains, ancient rain forests and heath lands. It is true wilderness. It is also where the great struggle between environmentalists and foresters took place in the construction of Lake Pedder. Keeping Cradle Mountain-Lake St Clair NP on the right and Franklin-Gordon Wild Rivers NP on the left we climb our way to Queenstown. Queenstown was once the world's richest mining town, mining copper, and was home to a massive logging industry. Nature is progressively working away at recovering and reclaiming the scarred landscapes created by mining and logging. From here, we head downhill to the coastal town of Strahan, on the Gordon River. Strahan has a dark convict history with the notorious Sarah Island off the shore. As you enjoy an explore day in Strahan reflect on the few convicts who made their escape from Sarah Island and made their way back the way you came on foot. Maybe the way to explore the history and the wilderness will be to take a river cruise operating out of Strahan. After a busy two days exploring Cradle Mountain, we head northwards back to the coastal town of Ulverstone. While the road is from mountain to sea, it is undulating all day. It is time to get back to the pastoral corners of Tasmania. Think cattle and sheep and cheese and hops and beer and food. Instead of taking a right turn and returning to Devonport, we turn left as we have one nutty thing still to do. We follow the coastal road through the picturesque towns of Penguin, Burnie, Wynyard and Boat Harbour to reach Stanley. The road between Ulverstone and Wynyard has sweeping ocean views and delightful beaches. You might be itching to stop and linger and we will get a chance to do that on the way back. We have our last explore day in Stanley, standing in the shadow of The Nut, a volcanic plug that rises 150 metres (450 feet) from the sea. The views from the Nut are 360 degrees and there is a chairlift option to get up and down (for those not keen on the meandering path). Nutty stuff done we retrace our steps to get to Devonport with a stop in Penguin on the way. Penguin is all about penguins, living and immortalized in statue form. We end the tour in Devonport, a busy coastal city hugging the Mersey River and Bass Strait. It is a great place to take a few days to wind down from an amazing cycle tour - walk the city, kayak the river, cycle the trails, enjoy the food, visit the museums. Travel home safely with a piece of Tasmania in your heart. We did. You will. The images below cover wind (the most important one on top), temperature and rain. Bureau of Metereology no longer publishes wind maps free. These synoptic charts show what happened last March - westerly and north westerly winds mostly. Temperature charts show city locations, all at sea level. It will be cooler in the mountains. 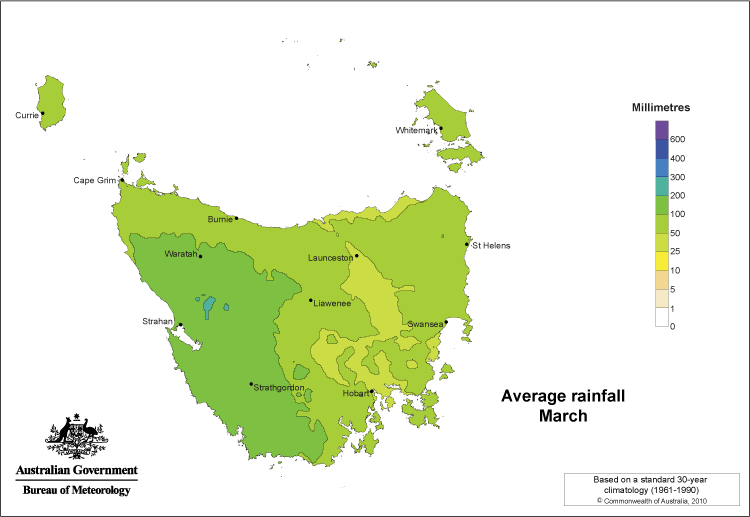 Rainfall chart shows more rain in the West.